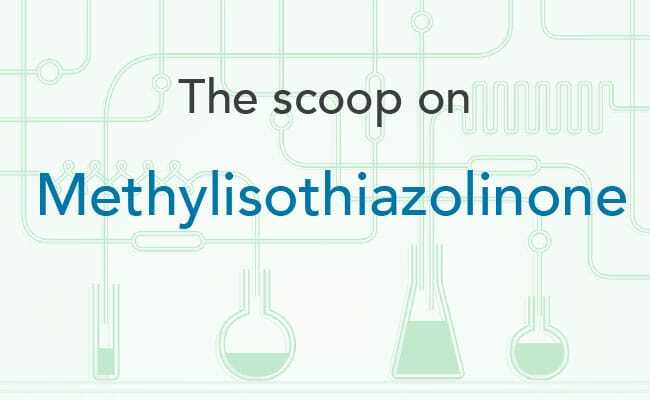 Methylisothiazolinone (MIT) is a preservative that is found in a wide array of liquid cosmetics, personal care products and cleaning products on the market today . Its function is to inhibit the growth of bacteria  . What products is methylisothiazolinone in? Methylisothiazolinone is found in a multitude of products, including those claiming to be “natural”. The list includes cleaning products, detergents, lotions, sunscreens, shampoos, conditioners, hair coloring, body washes, mascara, shaving cream, make-up remover, liquid soaps, and baby products including wipes, lotions and shampoos . MIT has been linked to allergic reactions, lung toxicity, and neurotoxicity . The European Society of Contact Dermatitis has recommended that MIT no longer be used in leave-on skin products . In Japan, the concentration of these ingredients are restricted in cosmetics . Health issues commonly linked to MIT include: skin reactions (it is a contact allergen), skin sensitization, painful rashes, inhalation toxicity, organ toxicity, neurotoxicity (based on lab studies on the brand cells of mammals)  . To avoid methylisothiazolinone, be sure to read ingredient labels and avoid products that contain MIT and any of the other synonyms like MICROCARE MT or NEOLONE 950 PRESERVATIVE used to designate the presence of this product. If you have sensitive skin, you should especially avoid products that contain both CMIT and MIT . For babies and young children, be aware that methylisothiazolinone may be in sunscreens and even baby wipes that have been labeled “hypoallergenic”  That’s because there are no government standards stipulating criteria for hypoallergenic products. In cleaning products, where manufacturers aren’t required to list all their ingredients on product labels, choose toxic chemical free alternatives without preservatives. Also remember that because there are no federal criteria dictating standards for what makes a cleaning product “natural”, a multitude of so-called natural cleaners contain this toxic chemical. It’s safer to go with options using only simple, non toxic ingredients. In personal care products, do your own research on a product’s ingredients by using a resource such as the Environmental Working Group’s Skin Deep product database. Campaign for Safe Cosmetics (2016). Methylisothiazolinone and methylchloroisothiazolinone. Available online: http://www.safecosmetics.org/get-the-facts/chemicals-of-concern/methylisothiazolinone/ January 23, 2017. EWG’s Skin Deep Cosmetics Database (2007-2016). Methylisothiazolinone. Available online: https://www.ewg.org/skindeep/ingredient/703935/METHYLISOTHIAZOLINONE/ December 20, 2016. Healthy Child Healthy World. (2015). The 5 Worst Ingredients in Kids’ Body Care Products. Available online: http://www.healthychild.org/the-5-worst-ingredients-in-kids-body-care-products/ December 20, 2016. US Department of Health & Human Services Household Products Databases. Available online: https://householdproducts.nlm.nih.gov/cgi-bin/household/brands?tbl=chem&id=72 January 23, 2107.